Tyres provide safety on a road in terms of stability, handling, control, brakes and fuel efficiency, without good tyres or too much old tyres lost all features that are essential for a car to be in perfect condition on a road, Therefore don’t wait more days, if you think the tyres are in a bad shape or become reached to a minimum level, therefore all about tyre tread depth gauge and other basic information are in detail in this topic. How to know my tyres are need to be changed? You can inspect from various methods, a number of tool and kits are easily available in the market as called tread gauge/meter which tells the exact position of a tyre life, in addition there is another manual method which most people used in case of checking tyres current condition is the penny test. 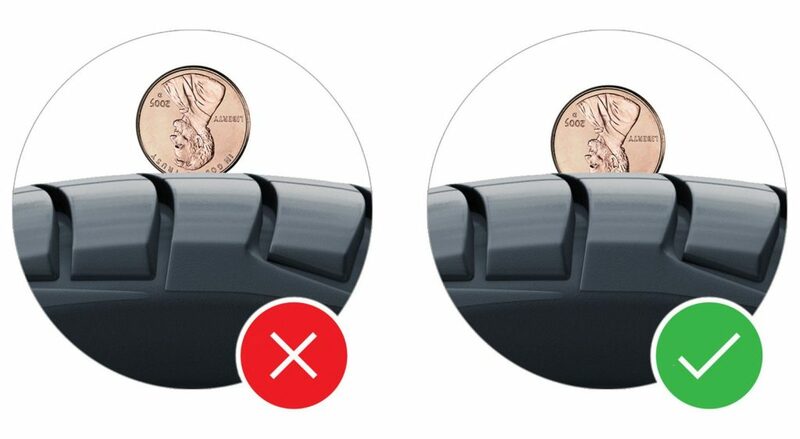 Penny Method: Insert a penny coin inside the tyre tread groove depth with Lincoln head upside down facing you, if you see all of a Lincoln head then the tyres tread depth almost reached to a minimum level and required replacement. Tread Wear Method: There is another way to check tyre tread depth is to look at the tread wear indicator bar that’s molded into most tyre. The bars are located at the center bottom of the tread grooves in various locations around the tyre. When these bars become visibly flush with the adjacent ribs the tire has no more than 2/32” of tread remaining. This is a clear visible indication that the tyre should be replaced. What is the tread depth of a new tyre? Normally the standard depth of a new tire is about to a level of 8mm or 10/32 inch deeper which is almost standard in various countries. What is a good tyre tread depth? All tyres are good if the tread depth are between 3.5mm to 8mm- 5/32 to 10/32 inch level. What is the minimum tread depth on a car tyre? Standard minimum level of tyre depth is 1.6mm but some countries do have a legal limit of 2mm-2/32 inch minimum level before required to replace from old to new ones. How do I check the tread depth of a tyre? As discussed above about the method to check the tyres tread depth, there are so many very economical gauges available on a market. 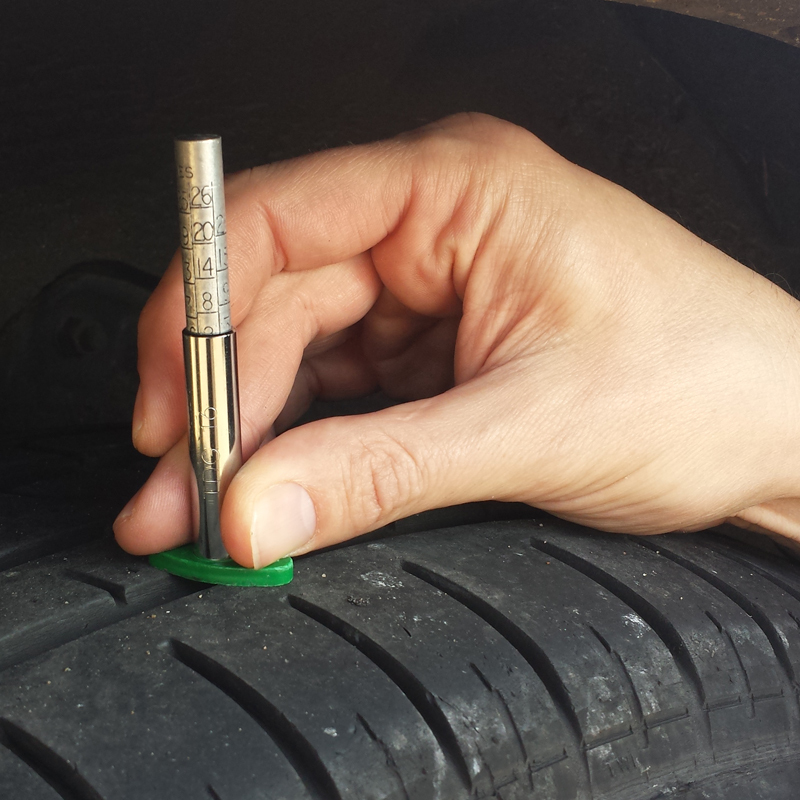 How to use Tyre tread depth gauge? You don’t have to take a lessons before applying a gauge on a tread depth of a tyre, simply insert a gauge on a tyre tread depth and measure the millimeters or inches, it will show the exact level of a tyre, here is an image for more detailed understanding. Here is a very economical and reliable tyre tread depth gauges on Amazon. If you want a digital meter in order to get more convenient then there are some of the best meters list are here as follows. How long the tyres can last? Normally the good tyres can do between 26000 to 40,000 miles, however some locations, low quality tyres and legal requirement prevent the tyres limit way less than these stated miles. Yes, there is a limit of approximately Six to 10 years, the reason is that tyres made up of rubber and there is a tendency that rubber degrade with age and becoming hard which can be harmful and dangerous if to use it especially on a hot dry season, it can be expires early than the recommended years regardless of tyre tread depth is in a normal level and how to inspect whether the tyres are in a bad condition. How to check the tyres expiration? 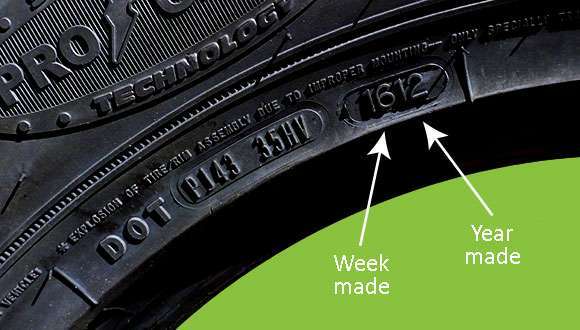 You can check from a DOT CODE printed on a sidewall of a tyre, here is an image clearly illustrated about expiration of a tyres. 28 PSI front and 30 PSI back is the recommended Tyre Pressure on a normal metallic roads, however less or more PSI per tyre vary according to Terrain and type of vehicle.